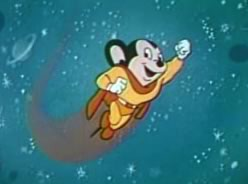 Investors looking for Mighty Mouse in the wake of a Global Bloodbath were not disappointed. Indeed, Mighty Mouse Bernanke Flew By at precisely 7:00 AM today. Click here for sound effect. It was a valiant effort. Several times the S&P rallied back close to even only to fall back. The Nasdaq never came close. However, Bulls can take no pleasure in the relatively dismal performance of tech and even less pleasure in the after hours session that opened up 25 points in the red on the Nasdaq and 8 in the red on the S&P. Anything can happen by the morning, however. Asia might be interesting tonight. Ambac Posted a $3.26 Billion Quarterly Loss, $31.85 per share with an operating loss of $6.21 per share vs. an expected $3.50 share loss. However, Ambac rallied on news that it was "evaluating strategic alternatives with a number of potential partners." Anyone feeding capital to Ambac at this point probably needs to have their head examined. Meanwhile, California Foreclosure Activity Is Still Rising. The number of mortgage default notices filed against California homeowners jumped last quarter to its highest level in more than fifteen years, a real estate information service reported. Lending institutions sent homeowners 81,550 default notices during the October-to-December period. That was up by 12.4 percent from 72,571 the previous quarter, and up 114.6 percent from 37,994 for fourth-quarter 2006, according to DataQuick Information Systems. Last quarter's number of defaults was the highest in DataQuick's statistics, which go back to 1992. On primary mortgages statewide, homeowners were a median five months behind on their payments when the lender started the default process. The borrowers owed a median $11,121 on a median $340,000 mortgage. On lines of credit, homeowners were a median seven months behind on their payments. Borrowers owed a median $3,379 on a median $56,000 credit line. However the amount of the credit line that was actually in use cannot be determined from public records. 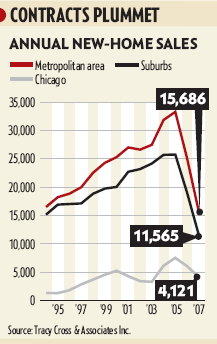 Crain's Chicago Business is reporting Housing crashes through floor. Sales of new homes in the Chicago area fell even faster in the fourth quarter, and with the economy on the brink of recession, homebuilders face another tough spring selling season. Builders sold 2,196 units in the quarter, a 51% decline from the year-earlier period and the biggest quarterly drop since the residential slump began more than two years ago, according to Tracy Cross & Associates Inc., a Schaumburg-based real estate consulting firm. Homes sold in the quarter at the slowest pace in 15 years, the firm says. "It's frightening, it's nerve-wracking — it's a lot of things," says Jerry Thiel, president of G. W. Thiel Inc., a Rolling Meadows-based carpentry contractor that employs about 30 carpenters now, down from 275 in 2005. With Mighty Mouse in need of help, all eyes are focused on Europe. Will the ECB and Bank of England be singing the same tune? ECB, BOE May Follow U.S. Fed Cut, Economists Say. "From a European and a U.K. perspective, the Fed cut adds to the risk of more and quicker rate cuts," said Amit Kara, an economist at UBS AG in London. Kara, a former economist at the U.K. central bank, predicts four cuts from the Bank of England this year and two by the ECB. "This market has been calling for help," said Alberto Espelosin, who helps to manage about $12 billion at Zaragoza, Spain-based Ibercaja Gestion. "The ECB should follow suit." "If it becomes clear that this is merely a temporary fix, and the situation deteriorates further, then the ECB will be forced to act," said Ken Wattret, an economist at BNP Paribas SA in London. Unfortunately, there is no "fix" temporary or permanent on either side of the Atlantic. The harder the Fed and ECB fight this mess the longer it will last. Housing prices, asset prices, and leverage all have a lot of unwinding to do. The problem is not liquidity, the problem is solvency. Anyone expecting another miracle save is going to be disappointed.